Costa Rica briefly threatened to score in the 1st half against Serbia but couldn’t muster up a goal. Serbia also couldn’t score the opening goal and the score at the end of 1st half was 0 – 0. Both teams regrouped and planned to come back strong in the 2nd half. After the break, the 2nd half went underway and at the 56th minute Costa Rica’s David Guzman got a yellow card and Serbia was awarded a free-kick. Subsequently, Serbia’s free-kick specialist, Kolarov took the shot and scored a stunning goal as he bent the ball into the top corner in the nets. Serbia were now leading by 1 – 0. Various substitutions were made after this goal as Costa Rica searched for an equalizer. But, despite several chances and 8 minutes being awarded in the 2nd halves injury time, Costa Rica couldn’t score and Serbia won their opening World Cup 2018 match. Novak Djokovic a happy man in the player lounge after watching Serbia edge Costa Rica 1-0. Due to speak to the media for the first time since “Interview Room 2” later this afternoon. 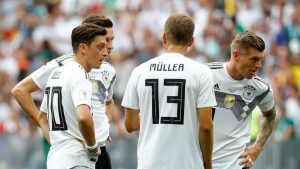 The defending champions of this World Cup, Germany started off their campaign against Mexico as the clear favorites to win this match. 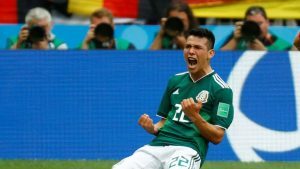 But, the Mexican team stunned the Germans as Hirving Lozano struck at the 35th minute to put his team in the lead. 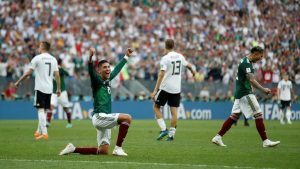 Germany’s strikers began to take their shots in order to equalize but they were completely blocked by the Mexicans who were constantly blocking off their attacks. At the end of 1st half Mexico were ahead by 1-0. The 2nd half went underway and Germany continued to dominate the possession and shots at the goal. But, none of it was helping as Mexico stood like a wall before them. With only several minutes of play left, Germany strikers intensified their attacks but couldn’t score. And, this is how the defending champions of World Cup 2018 lost their opening match against the underdogs; Mexico. I can cheer for Hirving Lozano. I can’t root for Rafa Marquez. One of this year’s World Cup favourites, Brazil started their campaign with a goal in the 1st half; courtesy Phillipe Coutinho. Despite getting close, Switzerland did not manage to equalise the score and the 2nd half ended with Brazil in the lead. But, in the 2nd half, Switzerland converted their chances as Shaqiri’s powerful cross was headed into the goal by mid-fielder, Steven Zuber. WATCH: Here’s the header from Steven Zuber that shocked #BRA and earned #SUI a 1-1 draw in Rostov. The scores were now equal. 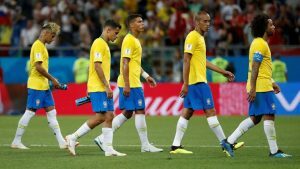 Brazil needed a tie-breaker to win, but they wasted most of their chances as Switzerland forced them to draw this match. Brazil was treated unfairly throughout this game! I apologize to all Brazil fans, this game was a right mess. We’ve all just witnessed the worlds worst referee. It is so kind of Brazil to underperform just like us. Join allsportspk tomorrow for the next matches of the ongoing FIFA World Cup 2018. 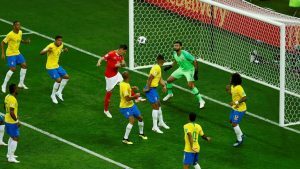 Previous articleBreaking World Cup 2018 – Brazil Vs Switzerland: Who Won…?